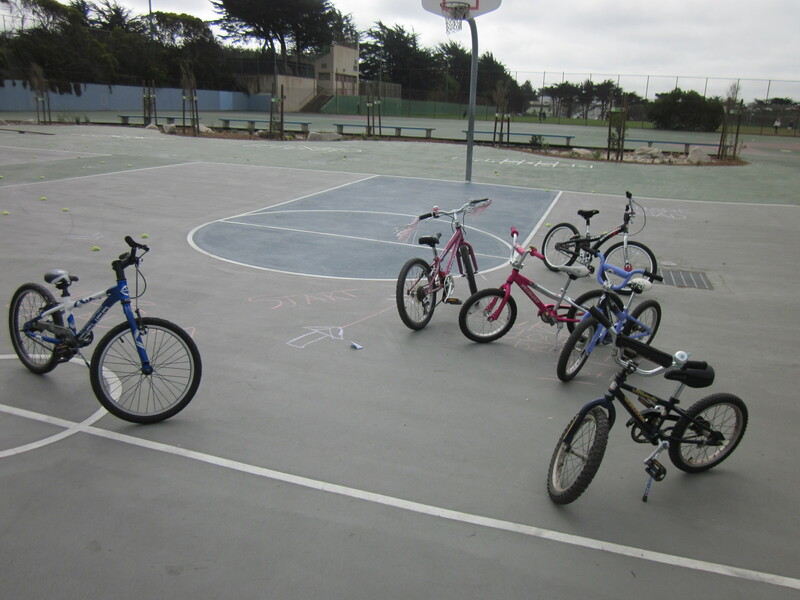 On Saturday I went back to the Outerlands, specifically to Sunset Elementary School, to attend one of the San Francisco Bicycle Coalition’s Family Biking Series classes, On Road with your Children. To my astonishment, I was asked to attend in a vaguely instructional capacity. I find it a somewhat depressing comment about the number of families in San Francisco with school-age children (there aren’t many) that I would be considered even vaguely qualified for this assignment. The guy who built up the tricked-out Kona Ute our PTA treasurer used to ride was there. The co-owner of Ocean Cyclery, which sold us my Breezer and our child seats was there. I was outclassed. I can, it is true, research any topic into submission, because doing research is my job and because I’m compulsive. But research is no substitute for experience, so this class involved some ugly duckling moments. The class met at the back of the school, and I had trouble even finding it until other people showed up so I could follow them. The parents teaching the class had been riding bikes for years and it showed; they were more graceful on their bikes than I have ever even aspired to be. And I found out that I was wearing my helmet wrong. All in all, it was a humbling experience. And it was a hugely informative experience. I didn’t bring my kids; they were at their swim lessons. It is just as well. Neither of them is competent enough on a bike yet to keep up with the kids who showed up for the class. (We are the blind leading the blind over here.) I will, however, take my son when he is more skilled. 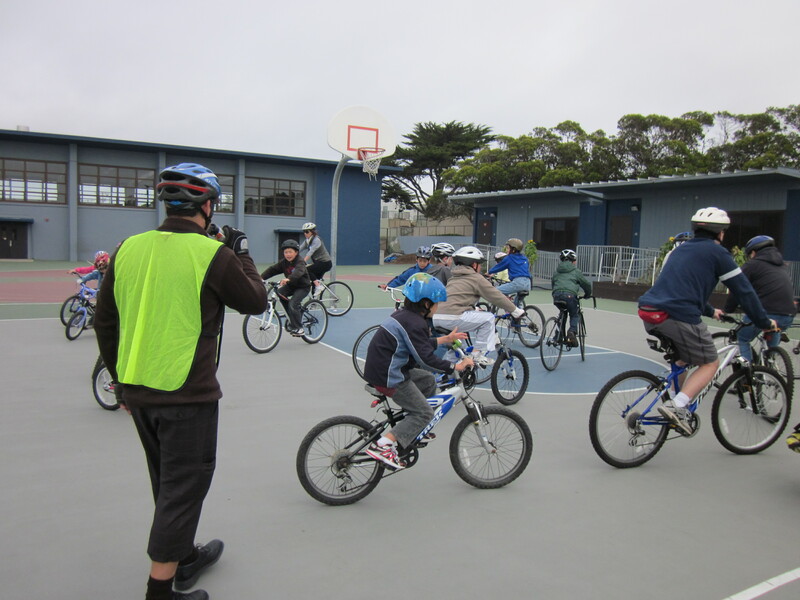 SFBC’s instructor for this class is fantastic, warm and lively and hugely competent at wrangling both kids and parents. Apparently he has been leading these classes for years. It shows. Matt and I signed our son up for summer bicycle camp this year. We didn’t thrust this upon him; he has been angling to attend bike camp since he heard that such a thing existed. But we’re all pretty excited about it. We are having trouble teaching him to ride safely because we live on a great big honking hill. Our efforts to talk him into going down to the park, where it’s flatter, to ride always fizzle; his enthusiasm evaporates with the walk down and on the rare occasions when we’re successful, he is too tired to walk back home. Although it is ridiculous to drive such a short distance we would do it, but he hates riding in the car. 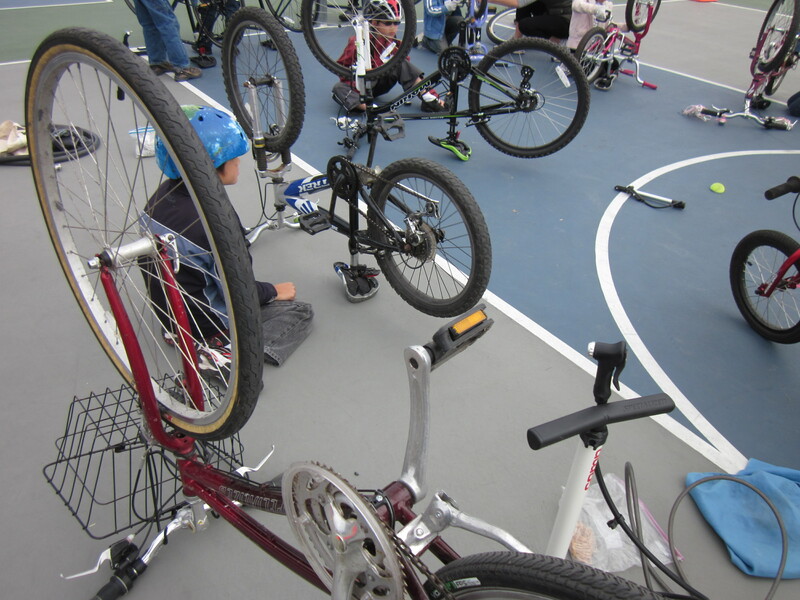 Bike camp seems to resolve a lot of problems at once; most importantly, it’s taught by someone much more qualified than we are. We had both harbored ambitions that at the end of a summer at bike camp, our son would be qualified to ride his own bike to school. Attending this class disabused me of this fantasy. The area around the school was slightly hilly, but nothing particularly troublesome for an adult rider used to the city. 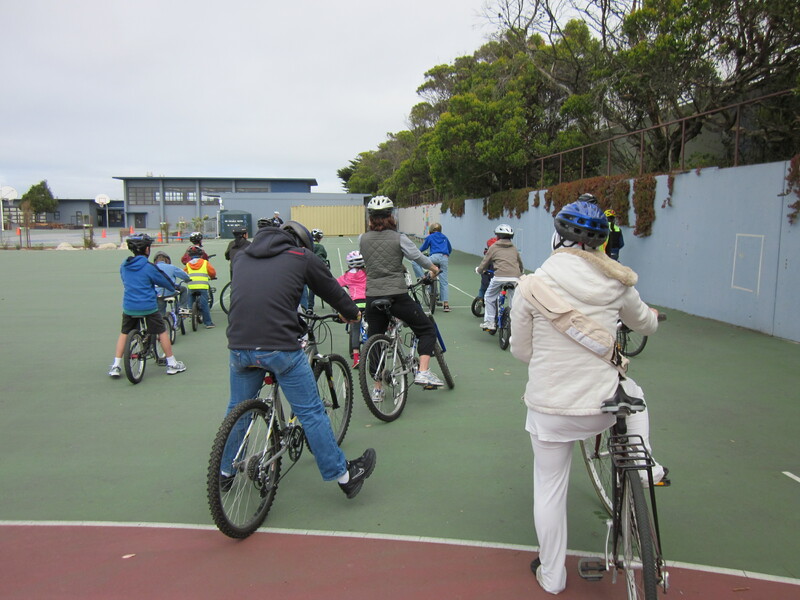 It was much more difficult for the kids, who were, I realized, mostly riding bicycles that weighed more than half what they do. I have ridden a heavy bike before, and remember how hard it was to start and stop and get up hills, but at least I had a lot of gears to use. The kids did not. No one is selling ultra-light bikes for kids, so I don’t see any realistic way for mine to handle anything more than minor elevation on their own. And the hills along our commute to school are anything but minor. What’s more, supervising kids on the streets of San Francisco was terrifying. The area around the school is very lightly trafficked, but at stop signs things fell apart. The kids attempted to wave drivers ahead of them, then lurched out into the intersection as those cars actually moved, or waited for cars to stop, then tried to take their turn only to be rushed by drivers who’d grown impatient. There are a lot of decent people behind the wheel in San Francisco, but a lot of jerks as well. I suspect that these kids, as well as our son, would learn to navigate neighborhood streets like these with more practice. But we go through much more serious traffic on our route to school, and I would not trust my kids in some of those intersections for years to come. Overall, I realized that riding in the city is too much to expect our kids to do alone at this age. 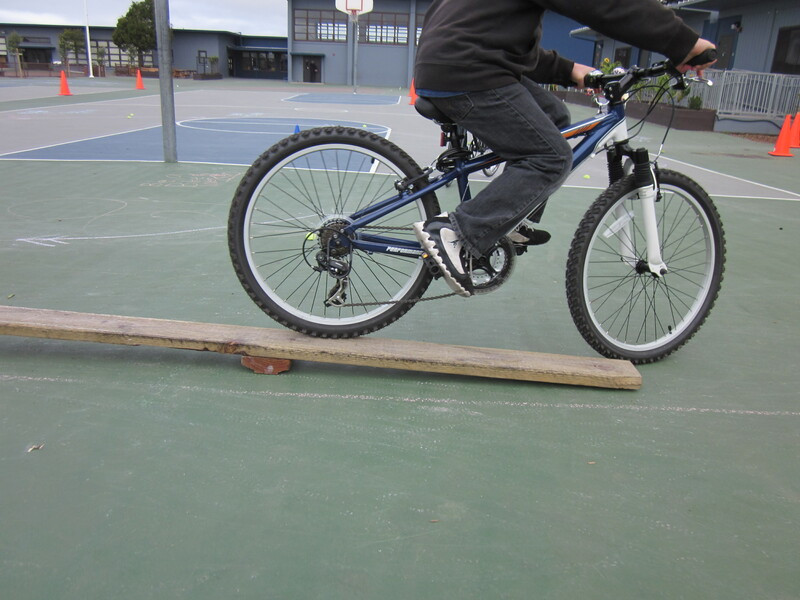 Our son will not be riding to school on his own bike next year, or the year after. 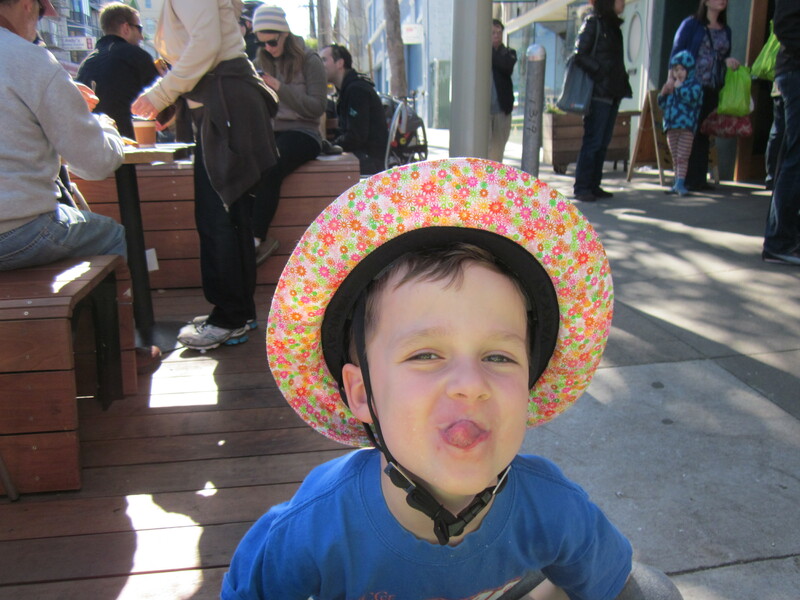 He wants to pedal, so a trailer-bike or tandem may be in our future. But he will not be riding solo. We are going to be working harder as he grows, and that is daunting. We had talked about possibly not needing an electric assist if our son began riding his own bike. But I cannot imagine hauling my kids up and down the hills to school without help once their combined weight exceeds 100 pounds. We are now in the position where buying a bike accessory that costs more than our bikes themselves seems inevitable. Despite this, I find I don’t mind the thought of keeping them on our bikes longer. My children have been growing away from me since the day they were born. Even in the newborn barnacle months, they were already exploring the world. It is thrilling to watch them grow more independent, but I know that eventually they will tire of being hugged, of sitting on our laps, of being picked up. My son is in first grade and already conscious that being affectionate with parents is not something that older children do. But when we’re walking or riding up a hill, all of this is forgotten. They look at the climb and want to be small again. “Mommy, will you carry me?” they ask. And I say, yes, I will carry you. I’ll carry you up the hill. I could carry you forever. Maybe you can rig up something to “trailer” your son’s bicycle to yours when he’s in the mood for cycling in the park? Here’s a pic of a Yuba Mundo set to trailer a bicycle. I’m planning on bungee cording the balance bike (admittedly much smaller and lighter than a regular child’s bike) to mine to get to the park. We’re considering an actual trailer for his bike, now that you mention it.